PROFESSOR Christopher Ameyaw Akumfi, Minister of Ports, Harbours and Railways risks legal action against him for allegedly employing the Task Force of the Ghana Railway Company (GRC) to demolish a structure belonging to Mr. George Owusu, a businessman at Kantamanto in Accra estimated at ¢400 million. Reports available to The Chronicle indicate that buildings along the same stretch of land belonging to other people were not touched. The paper gathered that the minister gave the order for the demolition by the Task Force, which was led by the area manager, Mr. Henry Sam. When contacted on phone, however, Mr. Sam declined to name the source of the instruction. He apparently switched off his mobile phone after he hung up. Prof. Ameyaw Akumfi said in an interview on Peace F.M radio yesterday that there were irregularities in the leased agreement, which the ministry thought of restructuring. According to him, Mr. Owusu had been notified to suspend construction of the building but ignored it. Mr. Owusu described the demolition exercise as selective justice, because his structure alone was demolished. “Is it because people have been saying I am an NDC member?” He asked. Narrating how the building was demolished, the caretaker told The Chronicle that as early at about 7.30am a group numbering 11 accompanied by two armed policemen cordoned off the area and drove everybody away. 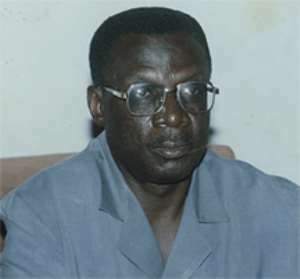 Mr. Owusu, flapping lease documents covering the plot, threatened to drag the minister to court. He said a couple of weeks ago the manager of GRC told him that the minister had ordered his structure to be pulled down. A letter was later written to him to suspend the construction of the building until a complete assessment had been done. The letter, dated December 4, 2003 signed by E. Opoku, the acting Manager and headlined, “Suspension of Development on Railway Land” stated: “It has come to our notice that you have commenced development of a project on Railways Land. In view of the pending GRC concession process the Minister of Ports, Harbours and Railways has constituted a committee to go into the lease of railway land and property. “You are therefore requested to suspend with immediate effect your development project on the railway land. Mr. Owusu said he was dismayed that two other stores between which his was located were not destroyed. According to him, he was not aware that his structure would be razed down until somebody from GRC told him a fortnight ago that there were plans to demolish structures at Kantomanto. He said he informed the MD of GRC about what he had been told and he assured him that his property would not be demolished but he should not continue with the construction.